NEKOOSA, Wis. — Don't call it a comeback. It's been more like an epiphany. At least that's the word David McLay Kidd uses to describe his return to designing fun, rather than frustrating, courses. Kidd, the Scottish architect who developed a reputation for building penal, topsy-turvy tracks such as Tetherow in Oregon and the Castle Course in St Andrews, has warmed to the idea of shaping more user-friendly courses. The latest proof is Mammoth Dunes, his engaging and entertaining creation that will debut in full in 2018 at Sand Valley Resort in central Wisconsin, a development led by Bandon Dunes visionary Mike Keiser. Keiser, who hired Kidd more than two decades ago to build the first course at Bandon, noticed the designer's change of mindset in 2014 when he played Kidd's course at Gamble Sands in Washington. "I've never lost contact with Mike," Kidd said. "I have spoken to him every few months for the last 25 years. For whatever reason, I was off doing my own thing, honing my craft. Sometimes to his pleasure, sometimes to his displeasure. He let me know about the courses I had done that were difficult, and how he didn't love those. He didn't think they were something he would want to build." But Kidd's work at Gamble gave him the chance to re-impress Keiser. "Mike called shortly after we finished that course and asked me to speak at one of his events in Idaho," Kidd said. "I said yes, but I asked him to then come and play Gamble Sands afterwards. I told him I had a bit of an epiphany and had gone back to what I had known so well when I built Bandon, that golf needs to be challenging but also fun and playable." Keiser made the trip, played the course and loved it. 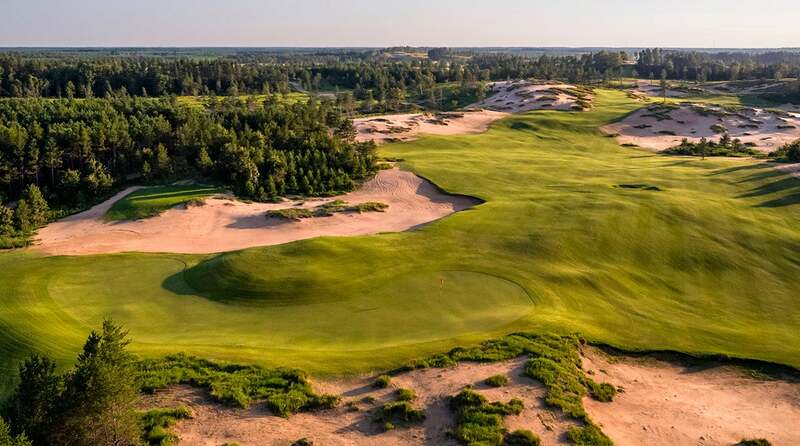 So when he was looking for someone to design a second course at Sand Valley Resort, three hours northwest of Milwaukee — where a Bill Coore and Ben Crenshaw design debuted earlier this year to rave reviews — Kidd tossed his hardhat in the ring, going up against Tom Doak and the team of Dave Axland and Rod Whitman. Knowing that subtlety might get lost in the weeds in a design bake-off, Kidd decided it was either go big or go home. While walking the proposed site, he had noticed a massive arrow-shaped ridge. "Each edge of the arrow is a mile long," he said. "When we studied it a bit more, we learned that it's about 80 feet tall, and in a state where anything over 50 feet tall is considered a mountain range, that was pretty big. So we had to figure out how to build a course in, around, over and through this giant ridge without it being an impediment. To make it an asset and not something Mike would say, this is no fun to walk on. That was the real challenge." Kidd won the job, and his layout, which evolved slightly after a last minute repositioning of the clubhouse, has more than met that challenge. The fairway widths are massive, as are the sandy areas bordering many fairways, yet there's only one forced carry off the tee, at the par-4 2nd. The greens are by no means small, but the total turf coverage is only approximately 20 percent bigger than the adjacent Sand Valley course. "Some people find that surprising," Kidd said. "When they play both, they think Mammoth Dunes is twice as big and that's not the case. Most architects want to play a game of deceit on golfers and not let them see the grass that lays between you and the green, and not to see the amount of width in the fairway. To try and create intimidation or deception, all the stuff that (Alister) MacKenzie would have preached 100 years ago. We started to wonder, is that right? Is that really the best way to get the average golfer to enjoy the game, or are we actually better off to give up the width and show it, although there is a line of desire people should hit the ball on. You're not going to lose a ball, so you can swing away with confidence knowing the worst that can happen is you may have a slightly harder recover shot rather than a birdie opportunity. It's those kind of subtleties that bring pleasure to golfers." As for that ridge, two par 3s — the 4th and 13th — traverse it expertly, while the 9th hole runs along one side of it, culminating with an amphitheater-like green setting. The drivable par-4 6th features a horseshoe-shaped green where Kidd used a basketball to figure out the angle of a sharp bank that can propel a putt from one side to the other. "It's a really useful tool," he said. "The details of the 6th and 14th greens were driven entirely by kicking a basketball around each. It doesn't roll exactly the same as a golf ball, but to a large extent, it will tell you whether the break is there, or if there's enough pitch to get the ball to roll. It's certainly better than guessing." The straightforward par-5 18th lacks the memorability of most of the other holes, but it does reflect Kidd's self-described design epiphany. "We didn't want anyone feeling foolish on the 18th," he said. "We didn't want to make a challenging par, but if you wanted to go for an eagle, there's a huge wide fairway and a 20,000-square-foot green. It's fun to try, so I definitely want people to come away worst case with a par, and best case thinking they could have made eagle." Kidd, who's currently finishing up work at Rolling Hills Country Club in Los Angeles, is also starting a second course at Gamble Sands and halfway through a project in Portugal. "Gamble Sands and Mammoth Dunes go back to what I instinctively knew when I built Bandon," Kidd said. "Golf should be a challenge for birdies and pars, and fun beyond that, not a penance. It shouldn't be something frustrating or humiliating. You should be able take on the challenges, and if you fail, the course should allow a recovery. That's something I may have lost sight of for a little while. These courses do exactly that. There's a few naysayers who may say of Mammoth Dunes, without having played it, that the fairways are so wide that there's no challenge. I would say, play them first and then tell me what you think." Mammoth Dunes green fees will be $165-$225 for day guests; $150-$205 for resort guests. The course is walking only.